Today I thought I would open up your eyes to the world of 'The Library of Fragrance', the brand name really is rather apt, with 300 fragrances to choose from it really is a library fragrance! Theres such a broad range of smells that can be worn alone or you can layer them up over each other to achieve that perfect scent. I was pretty blown away when I first took a look at the Library of Fragrance website, they have some classic more tradition scents that you would expect to see from a perfume brand to the more unusual, unique and out there scents like Thunderstorm, Gin and Tonic, Snow, Pizza and even Dirt, see I told you they where unusual but oh so fabulous! The first scent I have to share with you today is Sunshine* and I absolutely love it! Sunshine is a fresh yet warm uplifting scent that has that beachy vibe, think of a hint of suntan lotion mixed with creamy vanilla and an ever so slight citrus twist and boom that's Sunshine in a bottle. 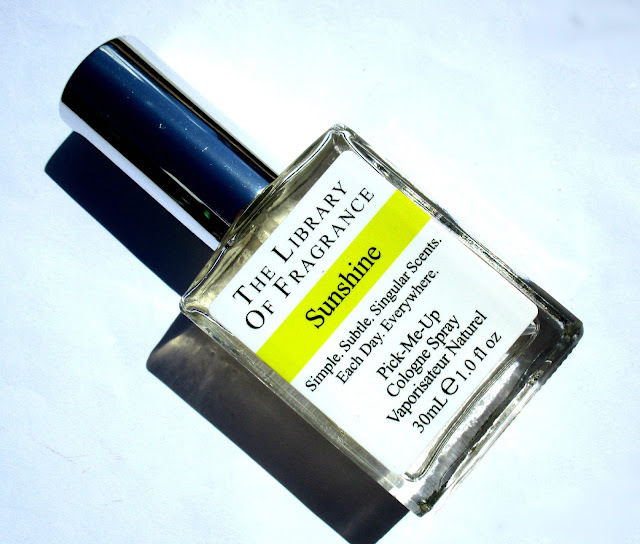 I find Sunshine's quite a light scent which makes it very wearable during the daytime and lasts on my skin around 4 hours which you might not think is very long but considering its a cologne spray the longevity is actually quite good. I think Sunshine is the perfect scent to wear during the summer time and is the perfect summer holiday abroad scent. Next up is Daisy*, another scent that I'm totally in love with which is described as a light, bright floral tinged with green that smells just like the daisy chains we made as children, isn't that the cutest description of a scent ever! 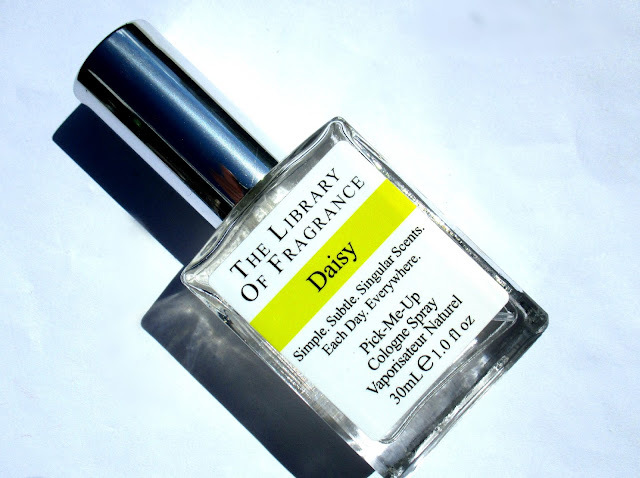 The scent description for Daisy is pretty on point, it smells exactly like a Daisy flower and is so fresh and Spring like, arhhhh I just love it. Just like Sunshine, Daisy is a very light, easy to wear scent that isn't overpowering in the slightest and lasts around 4 hours on my skin. If you like yourself a floral scent then I honestly cant recommend Daisy enough. As I mentioned before you can mix and match The Library of Fragrance scents to create your own custom fragrance, this is because they are all 'linear' fragrances which means that they're only 'single note' scents and don't change over time like usual fragrances do that have 'top', 'heart' and 'base' notes, pretty snazzy hey. Packaging wise... I love the simplicity of the bottles and their 30ml size means they are great to throw in your handbag for refreshing on the go. Overall The Library of Fragrance is an absolute hit with me and I'm so happy I've come across the brand. You can shop their 300 fragrances on the Boots website and each bottle of gorgeousness will set you back £15.00 or you can take advantage of Boots currents 2 for £25.00 offer. 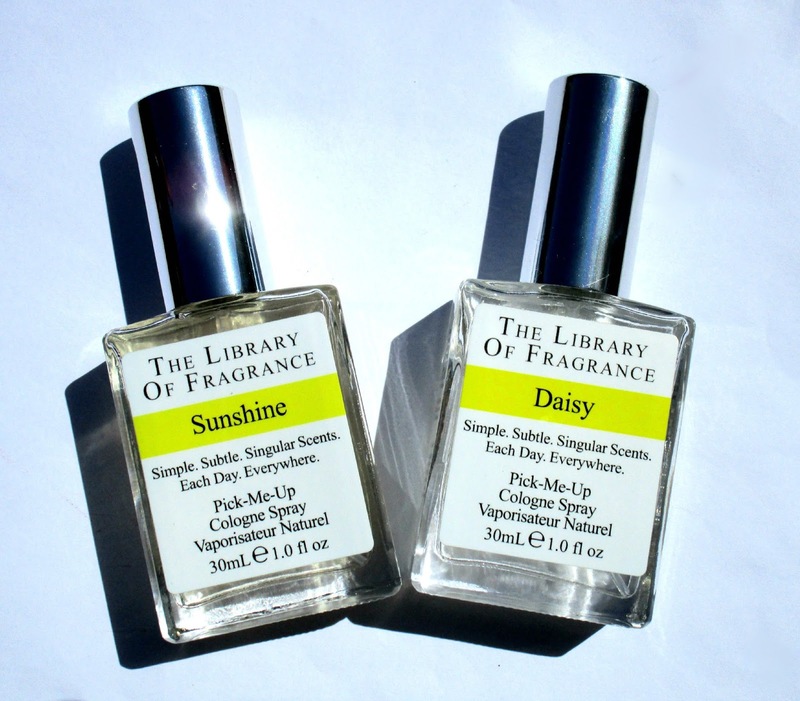 Have you tried any scents from The Library of Fragrance beaut's?? What one did you pick?? I'd love to know!! Don't forget I'm currently giving away a pair of shoes of your choice from the Shoetique website, there's only a week left beaut's, you can enter the giveaway here.